(on A257, Canterbury to Wingham). Master Irish fiddler Tommy Peoples from Donegal has again accepted an invitation from Beau of KentFolk and Valmai of The Lewes Saturday Folk Club to visit the South East of England in the Autumn of 2009, as a Fiddlers Various special event. Tommy Peoples is, quite simply, a living legend, the greatest exponent of the driving Donegal style which is his hallmark. Tommy Peoples was an early member of the Bothy Band, and has recorded numerous CDs (discography: a, b). 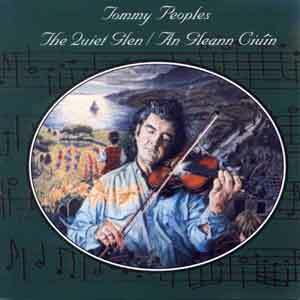 His remarkable self-produced CD "The Quiet Glen" (1998) earned him Ireland's highest accolade as "Traditional Musician of the Year", the first person to be so honored by the Irish Government. In spite of this he is an intensely modest man. At the time Tommy was living and playing regularly in County Clare - KentFolk paid a wonderful 10 day visit in 1999, following Tommy from gig to gig. Tommy then moved to the USA, where he gave workshops and concerts. More recently Tommy has moved back to his old family home in County Donegal, and we have a chance to hear him again in the UK. Catharine Kingcome, who has painted many Irish musicians in addition to the above picture about Tommy, and is a fiddler herself, says of Tommy : "in my opinion probably the best trad Irish fiddle player there's ever been". For myself, I hear a complexity and detail in his playing that I have not heard elsewhere. KentFolk flew to Scotland just before Christmas 2005 and attended a workshop and recital by Tommy near Glasgow, and also Fiddle 2005 in Edinburgh, where Tommy gave both a talk and a concert. If anything there seemed to be an even greater depth to Tommy's playing. Note: in 2007 both Lewes workshop and concert SOLD OUT when there was still a month to go. Tommy Peoples has accepted an invitation from Valmai of The Lewes Saturday Folk Club and Beau of KentFolk to again come from Donegal to the South East of England in the Autumn of 2009. Tommy will hold an all-day fiddle workshop at The Lewes Saturday Folk Club (formerly the Lewes Arms Folk Club), Lewes, near Brighton, Sussex, BN7 1YH, on Saturday 12th September, 2009, and then give a recital as part of the evening folk club. The workshop will follow the standard format of Lewes Arms Folk Club workshop days and there will be twenty places at £40 each. Separate tickets for the evening folk club, when Tommy will give a recital, will be available in advance at £9 (maximum approx. fifty people). To register interest in the Lewes Arms events and receive a booking form nearer the time, please send your postal address to Valmai Goodyear, 20, St. John's Terrace, Lewes, BN7 2DL. Full details will also appear on the club's website www.lewesarmsfolkclub.org; Tel. 01273 476757. 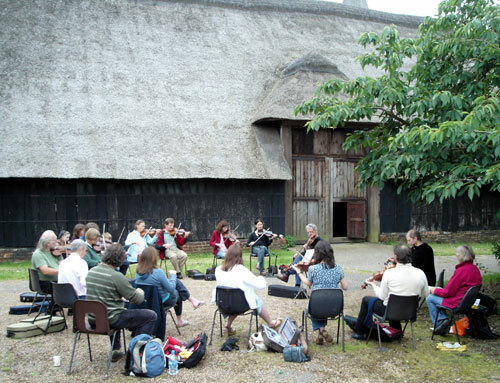 Note: Valmai reports (early July 2009) that the Lewes workshop has SOLD OUT, and the concert tickets are going fast. The following day, on Sunday 13th September, 2009, Tommy Peoples will come to Kent, and hold a full afternoon's workshop at the excellent Littlebourne Thatched Barn, near Canterbury, Kent, CT3 1TU, followed by an evening concert. Workshop : 2pm - 4.45pm, at the Littlebourne Thatched Barn. Tickets are £25 per place, and places will be limited. Evening Concert : 7:30 pm for 8pm, to about 10:30pm in the Littlebourne Thatched Barn. Tickets are £15 each. 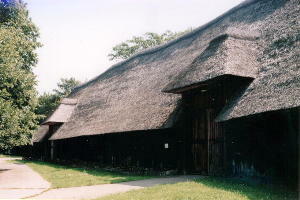 Littlebourne Thatched barn is at the intersection of Jubilee Rd. and Church Road, just next to the church (map). If you are interested in the workshop, please print and fill in a Workshop Booking Form, which gives further details. - or more simply, web based booking is now live for the Littlebourne events below. Buy your tickets in advance - buy your ticket early so we know how many chairs we need. Food is available all day in the villages, in a number of pubs, inns, hotels and restaurants, and there is a campsite, but do phone to book - follow the above link for more details. Dr. Beau Webber, beau@kentfolk.com ... 2009-01-25. Folk , Celtic , Bluegrass , Blues , Jazz and Cajun music in Kent, UK. Kent gig calendars , news , gig reports , photos , video & MP3 music . Kentish folk-clubs , sessions , open-stages and sing-arounds . Kent venue and musician listings. KentFolk iGoogle Gadget .